I "think" I may have seen this once before in a 2's game.. but now I have a screenshot of it. Last night my 3's team was playing and we tied. Kyllia (our rogue) was our last man standing, but had only about 20% health. 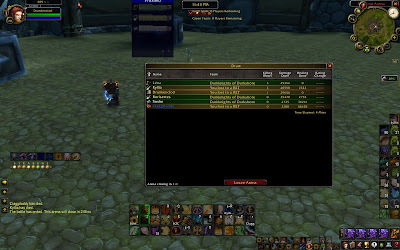 The opponent's team had a hunter left with around 70% left. I figured our chances were slim, but we cheered Kyllia on, and he managed to close the gap. I thought he'd die any second but instead the hunter's life kept shrinking. Suddenly the the summary screen comes up and... a TIE! FYI if you ever receive this. A tie gives no points AND DOES NOT COUNT AS A GAME. We were at 9 games going into this and stayed at 9 games after.